Town of Oyster Bay officials were the first on Long Island to announce their commitment to opting in on New York State’s recent initiative to allow furloughed employees a 90-day extension to pay their property taxes. 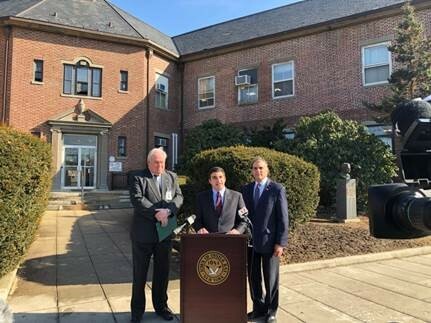 Oyster Bay Town Supervisor Joseph Saladino, Councilman Lou Imbroto and Receiver of Taxes James Stefanich pledged their commitment to the new State law, which was recently signed by the Governor. The regular deadline for the first half of general tax payments is Monday, February 11th. The Town Board is expected to vote on the extension for furloughed employees at its next Town Board meeting, scheduled for Tuesday, February 12th. For more information on the proposed tax extension, contact the Receiver of Taxes Office at (516) 624-6400.